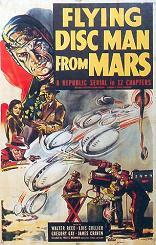 A strange craft spying on industrialist Bryant's (James Craven) plant is brought down by his new atomic ray. Bryant then meets the one survivor... Mota from the planet Mars. Not exactly benevolent, Mota enlists the aid of Bryant (a former Nazi) in a scheme to bring Earth under control of a supreme dictator, for its own good of course, using advanced atomic weapons. But their attempts to steal uranium alert Kent Fowler of Fowler Air Patrol, who sets out single-handed to foil the villains. Fist-fights and wrecks result in every episode.